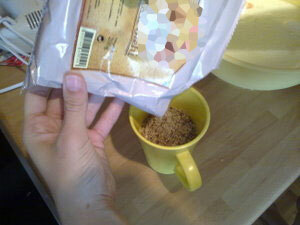 Fill the cup with wheal meal. The size of the cup should be about 2 dl. 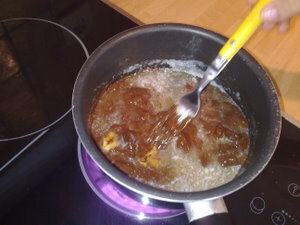 Now put this wheal meal into bigger dish. 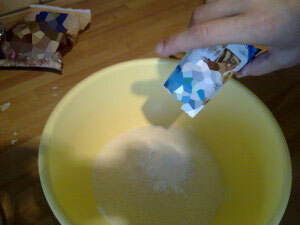 Add baking pouder and mix everything together. 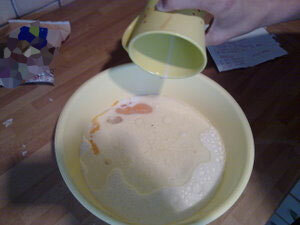 Take two eggs and brake them into the dish. 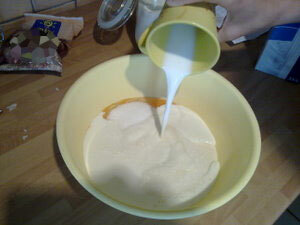 Add cup and a half of milk. 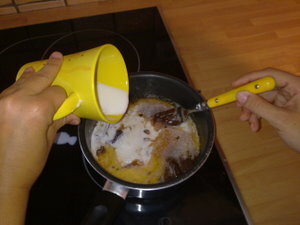 Add half cup of oil. 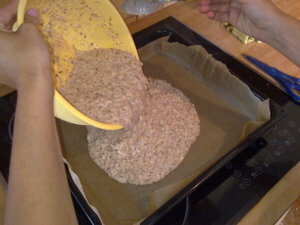 Prepare two cups of ground walnuts and put them into the dish. 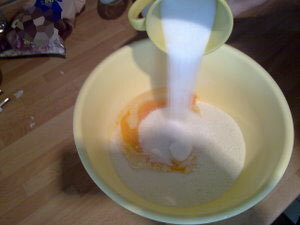 Now add three bags of vanilla sugar. 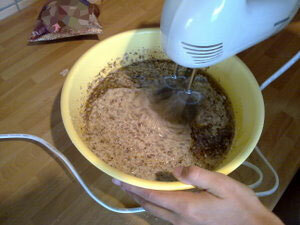 And mix everything with the blender. Take four apples, wash and peel them. You can use peeling or ordinary knife to peel the apples. Now scrab the apples into one empty dish. 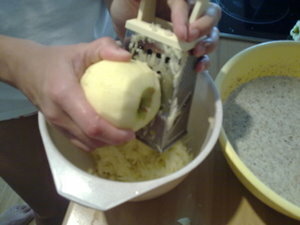 When you are done with scrabing put scrabed apples into the dish with the mass you have prepared earlier. 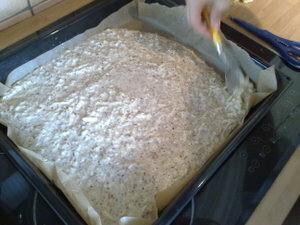 Now put the baking paper on the baking tray. 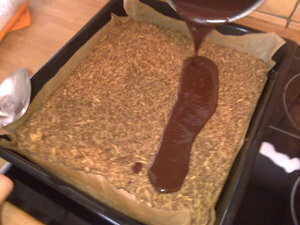 If you don't have baking paper you can greased the tray with an oil. 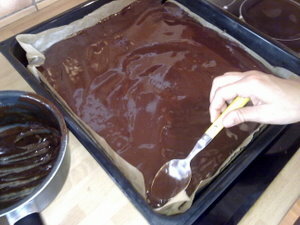 ... and spread it over the whole tray. 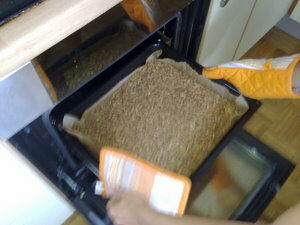 Now put the mass into the oven and bake it for about 30 - 40 min at 180 degrees. 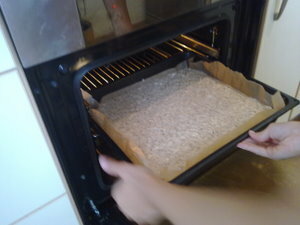 After baking time is over, take the mass out of the oven. 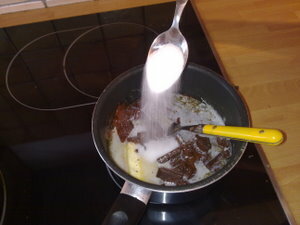 Check with the fork if mass is baked. 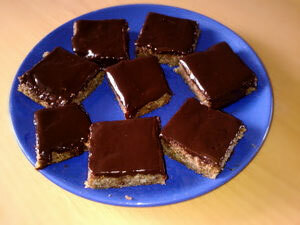 In case the mass stays on the fork, it is not baked good enough. 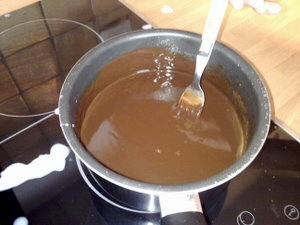 Now we will prepare chocolate, which we will spill over the cake. Put it in the dish and put the dish on the stove. Set the stove to maximum temperature. 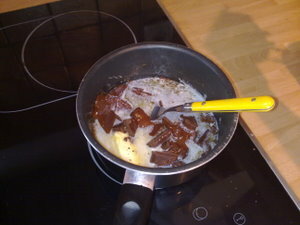 .Take 200g of cooking chocolate and put it in the dish with the butter. 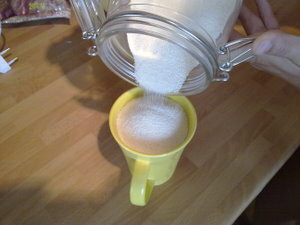 Add one spoon of sugar. 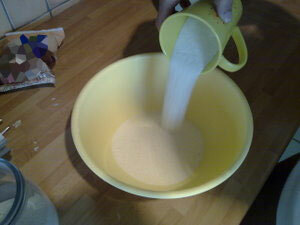 During cooking it is good to mix it continuously. 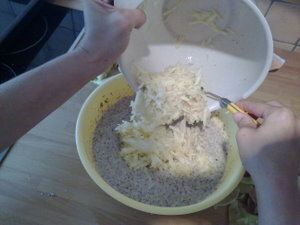 Mix everything and cook it until you get flowing mixture. 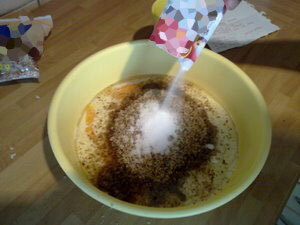 ... and spread it over the whole cake. 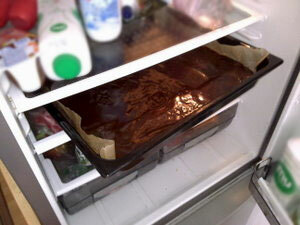 Now leave the cake to cool down and then put it, for about an hour, in the refrigerator.